Appreciating the old and discovering the new. In its infancy, much of the development of Vancouver Island was the result of exploration and the search for natural resources. This was certainly the case for Nanaimo, a city built on coal, and was the driving force that led to the creation of this new settlement on the central eastern shores. As time passed, the city continued to grow to support the demand for coal and the associated industries and commerce that followed. This rapid growth, British investment, and accessible location, solidified it as a major industrial centre and a hub for trade and transportation both via land and water. Its economic diversity and recognition as a major destination hub is what has allowed Nanaimo to withstand the changes of the modern world. While the fires stoked by coal have dwindled away, it continues to grow. We zip in and out of Nanaimo, be it by air, land, or sea, to reach the mainland, visit Tofino, head to the Comox Valley, or venture south to historic Victoria. Despite its hub moniker, many often overlook the countless opportunities that exist to stay and explore. Any great day trip starts with a little bit of adventure to invigorate the body and mind. 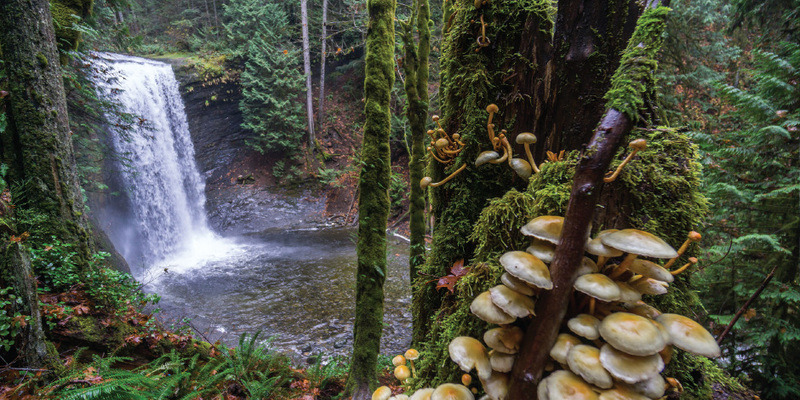 The list of places ranges from a dog friendly hike around the Colliery Dam Park to an adventurous hike to the top of Mount Benson, but the one that will leave you mystified and entranced is sitting at the foot of Ammonite Falls. Sitting within the boundary of Benson Creek Falls Regional Park, the Falls received its name from the fossils that line the rocky outcroppings. The trail to the park is on easy terrain, and for the brave, one can scale down a rope hanging from the lookout to the river below. The trail to the falls and back is 5KM long and you can expect to spend at least 2 hours there. Now that you have worked up an appetite, the next adventure awaits in the form of urban exploration. Downtown Nanaimo is home to countless cafés and restaurants that satisfy: Modern Cafe, Mon Petit Choux Cafe Bakery, Gabriel’s Gourmet Cafe or the eccentric and unique Vault Cafe. The Vault Cafe is found at the corner of Albert and Wallace streets in the historic Merchant’s Bank building. This regal building is registered with the BC Heritage Trust and was designed by Francis Rattenbury, the very architect responsible for the Empress Hotel in Victoria, and the Cafe does it justice. From unique soups to savoury all day breakfast, complimented with fine coffees, you will satisfy your hunger. After enjoying this comfortable and memorable setting, a stroll around the historic streets of downtown Nanaimo is in order. You will notice the unique fan shapes of these historic city streets all lead to the focal point of the Bastion–the first permanent structure built in the city and last original standing Hudson’s Bay Company bastion in Canada. Along the way, you’ll find the Nanaimo Museum and Vancouver Island Military Museums. Drop down to the charming and lively Harbourfront Walkway, which is terrific every day of the year, but be sure to watch for Santa Clause’s arrival via floatplane during Christmas season. Make one of your stops at the Nanaimo Courthouse, built in 1895. It’s one of the most significant stone structures in the city, also registered as a national historic building, said to signify the coming of age of Nanaimo and set the stage for its status as a regional centre. As you wander and explore the historic buildings in the downtown core, don’t forget to put one little, extra piece of history to work for you. Grab a Nanaimo Bar Trail map and sample each establishments take on one of Canada’s most famous sweet treats, the Nanaimo Bar. Port Nanaimo is home to an impressive cruise ship terminal built in 2011; it’s an iconic landmark representing the rebirth of a vibrant new awakening for this evolving city, but also a connection to its past. Built primarily with massive wood beams, its unique wood features pay homage to the logging industry that once occupied this site. The inside of the building mimics the hull of a ship and the massive windows overlook the harbour, letting you feel as though you’re set adrift. If time allows, put this beautiful building on your agenda. The end to a fine day is capped off nicely with relaxing visit to White Sails Brewing, just down the street from the Courthouse. This fine brewery cares about its community and is proud to call Nanaimo home, so much so that the knot in their logo represents the bond between the brewery and community. The brewery has regular community events, recurring open mic nights, and a friendly, welcoming atmosphere. They have a fine selection of flagship beers and provide tasty snacks from local providers. You’re also welcome to bring your own food. 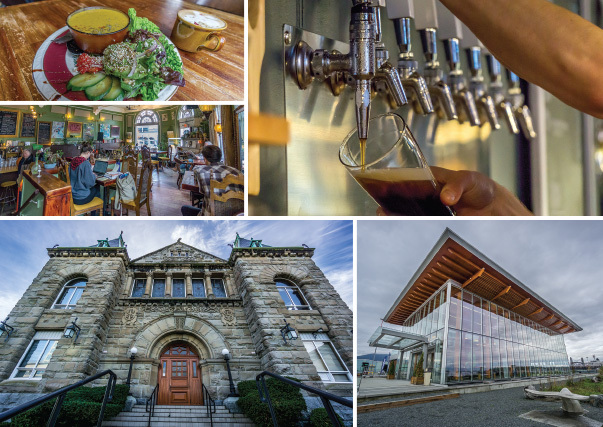 Nanaimo offers up much to do, from exploring the outdoors to visiting historic buildings, all enhanced with lagers and lattes. Explore Tourism Nanaimo’s 101 Things to See and Do and you will quickly realize there might just be more than that.